Size: 380 x 469 mm. 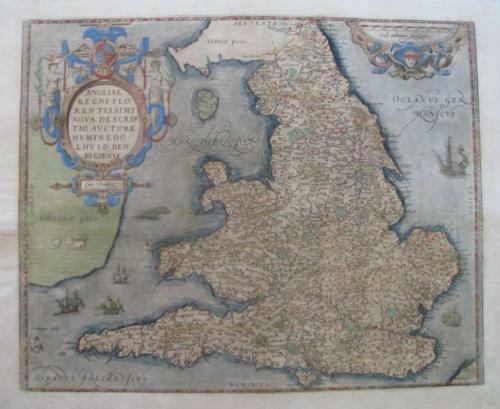 From the Theatrum Orbis Terrarum - French Text - this is Humphrey Lloyd's depiction of England and Wales published in the first Additamentum to the Ortelius atlas. The map presents an interesting picture of the southern Welsh coast and the Devon and Cornwall peninsula. This is curious as Lloyd himself was a Welshman, and a noted cartographer, and this depiction was certainly obsolete at the time of publication. The condition is good with a dark impression and good margins. There are some peper repairs to the image and some margin chips have been professionally filled.